The Center City Connector, and most importantly its dedicated north/south lanes on First Avenue, were thrown into limbo, with their funding endangered. The 4th Avenue bike lanes, together with major missing parts of the Pike/Pine bike lanes, were postponed ($). The planned rechannelization of much of 35th Ave SW in West Seattle was canceled, despite stellar safety and performance results from the first phase of the project. Planned safety improvements to Rainier Ave S—the city’s most dangerous street—were watered down over cars accessing I-90 ramps, again despite impressive results from changes in Columbia City. SDOT’s insistence on allowing cars to pass stopped buses on NE 65th St has given rise to successive designs with serious safety issues, despite a long series of accidents collisions in the corridor, one fatal. SDOT allowed Montlake residents to veto a bus lane on 24th Ave E in favor of an unneeded general traffic lane that will continue to delay buses approaching Montlake. A redesign of the terrifying northernmost portion of Fauntleroy Way was put on indefinite hold. SDOT ignored extensive feedback requesting pedestrian- and bicycle-friendly changes to its Lander Street overpass, and is proceeding on schedule with the flawed original design. It’s hard to imagine a decision that would positively affect more people outside cars, at lower political cost, than making Third bus-only. Given bus ridership and private car numbers, red paint on Third would overwhelmingly benefit, not hurt, the users of Third. And almost all of the users who would benefit are Mayor Durkan’s constituents. 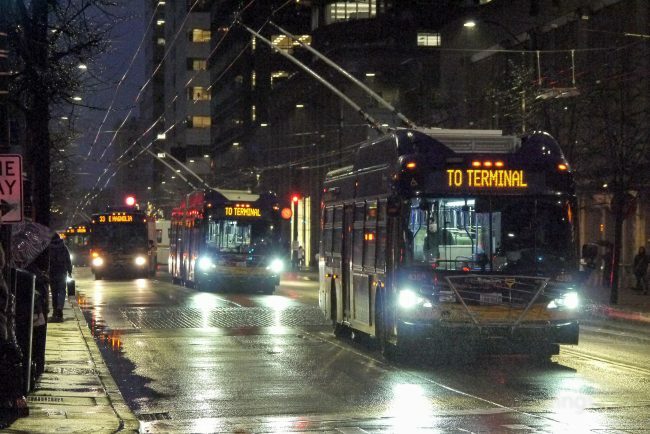 Much of the OCC work has focused on corridors that primarily host regional service, but Third Avenue bus routes overwhelmingly serve Seattle and its residents. Furthermore, a true dedicated bus corridor on Third would be the best way to mitigate any loss of the CCC project’s dedicated lanes on First. Combined with other improvements planned for Third—notably all-door boarding at all stops—a dedicated bus corridor with well-executed signal timing could significantly improve travel times. Center City Connector streetcars were expected to travel between Jackson and Pike in as little as six minutes, which is not far off the time taken by buses in the transit tunnel. If Third Avenue travel times could be in the same range, Third would become one of the nation’s most effective bus corridors. Given the wide variety of Seattle destinations they serve, making Third Avenue routes faster would enhance mobility both in the city and throughout the region. It would make a real difference to everyone who gets around without a car. Mayor Durkan, take your opportunity to make that difference, and break 2018’s pattern of car-centric decisions in style. Make Third a dedicated bus street. There has been a non-stop beat of troubling transit news to track down of late. We hope the Mayor chooses to move in a different direction from here. Getting 3rd right would be a very good first step. I see cars driving down 3rd while I wait for a bus during rush hour all the time. Maybe they’re confused but more than a few definitely know what they’re doing. This might be second only to box blocking on the list of things SPD needs to do a better job at enforcing – they can stop pulling me over for jaywalking too while they’re at it. Enforcement of 3rd is going to be a continual challenge. There’s an obviously huge equity issue in the enforcement for jaywalking. I worry that also continues with the vehicle enforcement – from what I see personally along 3rd it appears to be similarly disproportionate. We will need to accept that jaywalking is an unavoidable part of becoming a crowded and dense major city. Yes, there will be some bus delays as a result (nearly saw a guy get killed by a 5X last evening, fortunately the driver was alert and slammed on the brakes) but it may very well be an issue where the solution is worse than the problem. As jaywalking becomes more common, Metro drivers will expect it and drive slower. Somewhat more comfortable with streetcars, but in Gothenburg I don’t think they call it jaywalking. However, one type of traffic absolutely incompatible. Cars. There is no enforcement that will be more effective than red paint. Paint is also much cheaper than enforcement, and doesn’t pull cars over in the middle of Carmageddon. Cue the: But a delivery truck needs to access the street. Ego all cars have to be allowed, because we don’t know how to print out a permit. The red paint doesn’t do much on Battery St, in my experience. Either out-of-towners are confused and overwhelmed by driving in Seattle (very possible) or they’re willing to risk getting caught to save a few minutes. Judging by the fancy cars I often see blasting down 3rd during rush hour, I’m willing to bet it’s mostly the latter. Anyone who subjects themselves to the horror of driving around downtown during rush hour is a little insane no matter what. I don’t see many cars from the Macy’s bus stop or the southbound stop at 3rd & Pike, certainly not enough to slow down buses. To me it looks like the buses slow each other down if anything. Maybe further north there are more car violations, but not in midtown that I’ve seen. Go a bit farther south. The worst area for violations in my experience is between Union and Madison, with long lines of cars often trying to turn left (illegally) onto University and Spring to reach I-5. There are also a lot of TNCs that try to turn left onto James. The vast majority of 3rd ave delays I witness are from backups of LEFT TURNING private cars headed for I-5 onramps, blocking the left lane, preventing skip-stop buses from passing buses stopped in zones. 1) Box-blocking. University Street is especially bad. 3rd Ave policy can only address #2 and #3. I think with some training Metro can address #4 with drivers. Too many get impatient sitting behind the leading bus at their stop, attempt to pass it but can’t squeeze by, and then block 3 buses skipping that stop. #5 and #6 are not solvable. Where is the underpass? Barriers like this are usually in conjunction with an underpass so peds can cross the street without waiting for a light. If you just have barriers without an underpass, then people have to walk to the next block to cross. Which is very pedestrian-unfriendly. #5 can be addressed (but not completely eliminated) by deploying the yellow texture strips, and signage; and giving Metro Transit Police jurisdiction over the bus-lane streets. Does Waze understand the 3rd Ave. turn restrictions? If not, it could be a case of drivers just blindly doing what their phone tells them to do. Related question: I have a vague memory of someone saying here, I think on one of the podcasts, that third avenue serves more buses per hour (at peak? in general? I forget) than any other street in North America, or perhaps even the Western hemisphere. I’ve tried to verify that but my research has come up empty. Does anyone recall who said that, or know what the source of that claim is? It was Jonathan Hopkins on our podcast. Does all-door boarding on 3rd mean that there will be a lot more FEOs to patrol those buses too? I’m not exactly looking forward to mis-tapping (I’m pretty conscientious about it, but over the years not 100% perfect) and getting a lecture, or having to produce my ORCA card on the way home at night. That brings up another interesting issue – my regular PM commute buses are often packed with standees and essentially impossible for FEOs to effectively patrol. Or, does Metro just hope most people are honest? I don’t know how Metro FEOs discern re-used paper transfers from brand new ones. They may be obvious, but I don’t know how hard they try to enforce re-use fraud. FEOs don’t have to stay on 3rd Ave. They can board and check further down the route. Yes, it will require a staffing ramp-up, but will still be much cheaper than several boarding assistants at every stop. Change fumbling will still be allowed at front doors. Less change fumbling would happen if the county council had the guts to impose a $3 regular cash fare. Political timidity all around is leading us into (hopefully only) 1 and a half years of bus gridlock. The Metro onboard readers work well for me. The on-street card readers that Rapid Ride uses are more finicky and seem slower. Maybe I’m out of practice. I assume the FEOs won’t stray too far from 3rd because they are unnecessary on trips inbound to downtown where everyone has already tapped at the front door. Riding up and down 3rd Avenue would be more efficient because they could enforce both ways. All-door boarding won’t work until all buses have ORCA readers at the back door. I don’t know if that’s coming with ORCA2, but I sure hope so. It frankly shouldn’t even be exclusive to 3rd Ave.
You’ll tap on the street at a kiosk. like how RapidRide works now. Are any of these sudden change-of-directions announced on Twitter, by any chance? Maybe Seattle can set an example to NPR and the rest of the media by calling their generator a manipulating imitation-flake? Given that SDOT managed to change the direction of the second *southbound* car lane on 23rd Ave E in its tweet, making the plan look dumber than cotton candy, I can see why SDOT would want to step away from the twitter button. More bad news is still to come in the next few days. The confusion exists within the document here — it says one thing at the top, and another thing later one (I commented about this earlier — https://seattletransitblog.com/2018/04/17/sdot-nixes-bus-lanes-montlake/#comment-797947). No has bothered to make a correction, but my guess is that they are adding two lanes southbound (up the hill) which makes a lot of sense. That is where you might need to pass a slow truck and where cars are less likely to drive really fast. It is also relatively safer, even if a car is speeding, as stopping distance decreases going up a hill (and increases going down). I don’t think you understand that the new mayor is not like the previous two ones. She doesn’t care much about your non-car city agenda and much more interested in having a more balanced approach. Wait till she’s not going to put move Seattle levy on reauthorization, and neither will KC file one. Frank, can we have a “block” function so [ah] like this guy when following an important post? Note, that I am actually not right-wing and I am actually disappointed with what is going on. But if you don’t see that the city politics took a 180 turn, that will only hurt more in the end. Mayor Durkan is not “anti” transit she just not “for” transit. It is probable not at the top of her “to-do list”. Although I fail to see the balance in stopping of holding all the transit projects under her control. Ian, I don’t think I said she’s anti-, I just said she doesn’t care much. Which is basically what you said (in my head, at least). What I meant by balanced, is more along the lines that she is not single sided, but tries to cater to everyone — how that will turn out we’ll see in a few years. Durkan is not taking a balanced approach. Adding transit and bike facilities to a transportation system overwhelmingly favorable to cars would be a balance approach. What she’s doing is perpetuation the highly unbalanced car supremacy approach. Obviously a balanced approach is not “I get to choose 90% of the toys first and all you other guys can fight over the rest.” That is balanced in name only. You must mean the City should take the same unbalanced approach it has for most of the past century. Balanced approach should at a minimum reflect the actual on-the-ground commute mode share in downtown, which is MINORITY personal vehicle (and yes, some space needed for deliveries and professional service vehicles). That is ridiculous. You don’t propose tolling downtown — a position that is so controversial no city in North America has done it — if you favor cars. I would love to toll downtown and SLU area 6-6 M-F. I would not mind reasonable tools on all freeways in the same time span. If we get tolling downtown, that’ll do a lot to make up for Durkan’s other failings around transportation choices. If we get a ‘study’ about tolling downtown, I won’t care at all and will happily vote against her reelection. If true, she’s making a looooot of enemies that could doom her administration and certainly any hope of a second term. Assuming transit/bike/ped advocates can manage to rally around a more appealing candidate than Mike McGinn, of course. About the Mayor’s enemies, Morgan and everybody else….only compared her to temporary resident of 1600 Pennsylvania spur of the moment. He I’ve got one very deep personal reason to dislike her having nothing to do with transit. Except some people from Olympia forced to spend some time a block from Angle Lake Station they didn’t deserve. For her, not matter of action, but her character. But for all things transit related, Seattle’s up against somebody who’s not corrupt, but with no affinity for anybody neither rich or powerful. Exactly like the people who slowly erased the Waterfront Streetcar from the renderings. Maybe same actual people. Wish they’d go public and take credit. Definitely experts at the technique. For transit and everything else for length of her Administration, every inch of paint-stripe is going to be Hell’s own fight. Mayor best sparring partner, in the sport though. I’m really excited that early next year I will get to drive from Westwood Village to Montlake. 35th will be as fast as ever, enforcement on the West Seattle bridge will be lax, I’ll have a brand new tunnel that will only charge me a buck, and those annoying viaduct buses will be back on the surface streets. I’ll then exit on Republican Street and jog over to Mercer, where my east-west vehicular travel will be prioritized against all others. I’ll merge onto an interstate that lacks any sort of HOV priority, merge across 5 lanes of traffic to get onto SR 520, and exit onto 24th Ave E where thankfully the bus lane proposal was squashed. I’m so glad that I will be respected as a driver once again. To the thousands of others I keep from getting where they’re going, maybe you should buy a car and join me. The city listens to you if you drive. What do you expect? Since when have politicians every really cared about doing the right thing whether for moral reasons or because it’s in accordance with empirical data? This is especially true of transportation. If you don’t drive, you’re at best a second class citizen. It’s been this way for a long time and isn’t much changing. This is why it’s dangerous to believe in people and why so many citizens have become so thoroughly disillusioned with the system, some even to the point of no longer favoring democracy. What’s the point when it never yields results? You could be a transit majority city and still have these issues. Just ask New York. Tune out and get high. It’ll make the ride a little bit easier. It’s the best you can hope for. Aaaaand that’s how we got here in the first place. 1) Extend the time where cars are banned. Add an hour on each end, for each rush hour. So that means instead of 6 to 9 AM and 3 to 6 PM, it will be 5 to 10 AM and 2 to 7 PM. This still gives delivery folks a chance to use the street, and covers all of rush hour (instead of the current system). 2) Toll it. Each and every intersection should have a toll. It doesn’t have to be very high. A couple bucks will do. Trucks will still use the street, as will those who pay for parking. People who cheat (drive more than a block) may still cheat, but they will pay a price (literally). Drive five blocks and you pay ten bucks. I think it is also perfectly legal to make the toll dynamic. Charge ten dollars during rush hour. That means you could get a ticket, as well pay a toll. But you will pay a toll for sure. This seems like such common sense to get some red paint out and make this street transit only. Maybe someone can to explain to me why this isn’t getting done. Isn’t because big business is putting pressure on Seattle to not “cater to transit”? Is the mayor/council worried about the Seattle Times commenters? Don’t want to be seen as anti-car? Are they worried about political contributions? Are they afraid that it will be too hard to enforce even if they paint it red? Or does the DOT really think it is not a priority? I think their main worry is traffic backups on the remaining streets. That seems to be the reason behind most of the refusals to build transit lanes. It’s not so much to privilege a few additional drivers as is is to avoid 2+-block lines of waiting cars. That’s seen as unacceptable, more unacceptable than delaying buses. We don’t have time to toll, we need to fix downtown now. Mayor Durkan is doing well. The increase in span of the 3rd Avenue general purpose restrictions is a good step. today, 3rd Avenue may carry about 130 trips per hour per direction. Postponing the two-way cycle track on 4th Avenue until after Northgate Link seems sound and helps transit. Going forward with it per Kubly would have made the period of maximum constraint a disaster. The CCC streetcar pause is also sound. If the project is deleted after the pause, the equivalent priority on 1st Avenue could be provided to bus per the suggestion of commenter RossB. That would solve the crisis and attract more ridership. Any chance the Mayor could be doing better with some effort to get enough transit into the Waterfront neighborhood, and all connecting with it, to keep streets from getting packed with traffic avoiding the DBT? Maybe I’m missing something, but has she said anything on that subject? I also don’t think it’s an either/or with buses and streetcars down a reserved right of way on First. At either end of First, like Virginia and Jackson Street, have buses signaled diagonally across an intersection to begin contraflow- saving need for left-side doors on the buses. Re: overhead, one set of vehicles, or both, could run battery. For ridership stats, I’d think of the streecars and the buses as part of the same street railway, at least between Pioneer Square and Pike Place Market. But beyond those two places, buses can continue through service on First north and south of CBD. Reason for “Connector” name is that design intent is to make the First Avenue track part of a line from Lake Union to Broadway via Pioneer Square and IDS. In Helsinki, car-lines 7 and 3, I think, are listed as passing many if not all major sight-seeing attractions through the city. As well as central business district. I also don’t see an conflict between sight-seeing and passenger transportation. Would insist on reserved lanes and signal pre-empt for whole line. But especially because I see whole route rapidly developing into a series of very attractive neighborhoods, line would likely attract passengers riding for different purposes on same train. But underneath it all, no secret it’s going on five years since I lived in Seattle at all- but watching from 60 miles distance, how the city is rapidly changing, and to me much for the worse. Hard-edged, expensive gated community with high membership dues. Says something, none good, that at height of a volcanic economy, there are more people going to work from residence in their cars than any time in history. So maybe I can say this about Jenny Durkan and be done with it. She’s the perfect Mayor for Seattle in the Spring of 2018. The equivalent transit priority on 1st Ave is not being proposed. Heck, it isn’t even being proposed on 3rd Ave.
“Bus only” on 2nd, 4th, and 5th also appears to be short-hand for allowing private car drivers to go one block. If Durkan plans to try tolls as an alternative to car restrictions, she better have a plan to have them implemented by September 2018. That way, if they fail to get buses moving faster, there is still time to spread some red paint, and then get permission from the legislature to have camera enforcement. Woonerf rules just don’t work for camera enforcement, and pull-overs won’t work at all during the Period of Carmageddon. I hope Durkan is factoring in the cost of extra City funds for more bus service to maintain status-quo headway on all the City-funded routes, if her tolls proposal doesn’t clear the bus lanes as effectively as a car ban. Red paint is cheap. Lots more bus service to maintain headway on routes is expensive. I don’t consider the congestion tolling more than a trial balloon and a distraction. I can’t imagine that it would go through in Seattle; it’d cause more outrage than the demand tolls on I-405 and the car tabs put together. I think the relevant council members need to have their chains yanked to put pressure on Durkan to stop being a doodyhead – at least explain her long term goals. The tolling needs to happen, too, and will improve bus movement by reducing box blocking by cars. But we don’t need cars tolled on 3rd Ave. We need them banned. We need the ban more then ever now that the SR 520 bus restructure is falling apart.